Coach Mario Cristobal had a chance to see what his offense should always look like, scoring 28 points in the first half of their win over Arizona State. In the second half, the offense and their coaching staff were strangely absent. The freewheeling game plan, so successful in the first two quarters, was put away, or forgotten, in the vault. The Ducks, especially quarterback Justin Herbert, were hobbled like a magnificent stallion that was forced to pull a plow, instead of doing what he was born to do. This is an example above of a “pin and pull” technique on a running play in the first quarter when the Ducks hit the Sun Devils with a variety of different looks that had the offense in a rhythm not seen lately. Calvin Throckmorton (No. 54) on the left side, pins the defensive tackle inside, while tight end Jacob Breeland (No. 27) kicks out the defensive end. Dallas Warmack (No. 75) pulls and leads on the linebacker. Travis Dye (No. 27) heads up field, “north and south” as they say, for a 23-yard gain. Dye gained 105 yards in the game, impressive given his unimposing stature. Dye follows his long run with another, this one above for 22 yards. The Duck offensive line executes zone blocking at its finest in a “stretch” play, where they step laterally, forcing the defensive line to do the same and then engage them in what amounts to a reach block, working to get their head to the outside of their man. In this situation, Oregon’s offensive line outnumbers ASU’s five-to-four with one middle linebacker. Right guard Warmack (No. 75) has a key block, cutting off his man and creating a hole in the middle. Jake Hanson (No. 55), center does a great job of stepping laterally and moving to the second level where he blocks the middle linebacker. Dye is only too willing to speed through the gap in the middle for another big gain, as now the crowd is roaring and so is the Duck offense. CJ Verdell (above) puts the finishing touch on Oregon’s opening drive with a six-yard touchdown run behind a powerful triple team by tight ends Breeland, Ryan Bay (No. 87) and tackle Brady Aiello (No. 66). Between them they drive two defenders five yards deep into the end zone, the kind of power physicality that Coach Cristobal is so fond of. The Ducks had four first downs on their first drive of the game, which in games past might have been a total for a quarter or half. 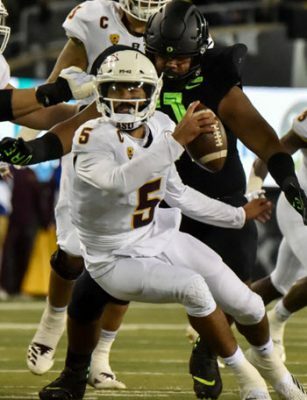 The Duck offense is still rolling, showing a variety of players attacking the Sun Devil defense, which is on its heels. Herbert drops back and with excellent downfield blocking by Breeland and receiver Jaylon Redd hits Verdell with a swing pass for a touchdown. Watch how Verdell (above) heads north and slashes through minimum resistance for a touchdown. The freshman running back has a physical talent for heading towards the end zone with a maximum of speed and power. Mixing the play calling and attacking all areas of the field, short and long, offensive coordinator Marcus Arroyo calls for Herbert to throw deep to Dillon Mitchell (No 13 above). The Sun Devil corner is not properly aligned or ready for the snap, and he pays for it, giving up a 57-yard touchdown to make the score 21-7. Oregon’s left tackle and the running back to that side might have made mistakes in their pass blocking assignments. The tackle is eyeing a defender who is dropping into coverage, while the defensive tackle is coming free on the rush from Herbert’s blind side. Arizona State closes the gap to 21-13, and leaves Herbert and the offense only 40 seconds to try and score. The Ducks run five plays in only 39 seconds for a 71-yard touchdown march. A key play is this tunnel screen above, a quick pitch to Mitchell, who is volatile in the open field. Warmack and Breeland provide clearing blocks for Mitchell who scampers to put the Ducks in field goal range, at least. The speed of this drive allows the Ducks to go for more than a field goal, however. The quick strike Ducks score their 28th points of the first half with this well executed fly sweep above, featuring Redd. Verdell is at the center of the blocking for Oregon, heading up to block with the same fire and speed as he does carrying the ball into the end zone. Wide receivers Mitchell and Brenden Schooler (No. 9) get in on the action with downfield blocks, reminding fans that’s there much more to their responsibilities than catching passes. The blocking downfield was excellent and showed that the receivers were aggressive and engaged in the total offensive plan. WHAT KIND OF ADJUSTMENTS DOES THE OFFENSE MAKE AT HALFTIME? DOES THE OREGON OFFENSE MAKE ANY ADJUSTMENTS AT HALFTIME? The first half displayed Oregon’s offense at its best. You had to ask yourself, what is happening, or not happening in the locker room at halftime? The Ducks notched 364 yards in offense in the first half, but only a miserable 85 in the second half. If not for a couple of turnovers caused by the defense in the latter stage of the game, Oregon’s offensive no-show would have lead to defeat. 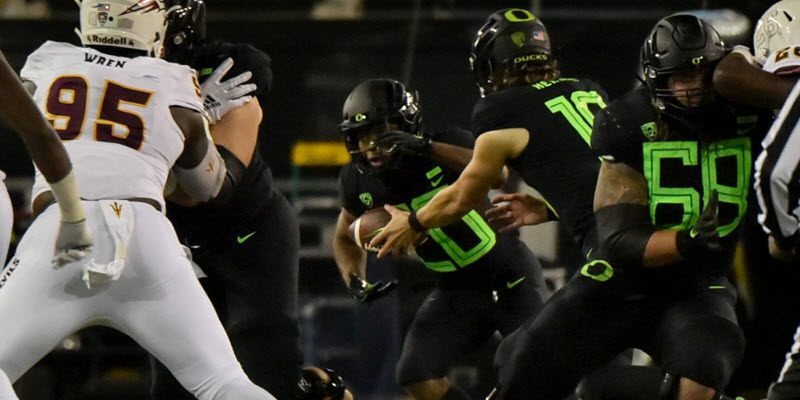 Herbert was 16-for-23 and 249 yards in the first half and only 2-for-8 and nine yards in the second half, and the Ducks almost lost a game that they had a 28-13 lead at halftime. Ironically, the field goal kicked by much-maligned kicker Adam Stack was the winning margin for Oregon who scored only three points in the second half. Cristobal and his Ducks face a very dangerous Oregon State team in the Civil War this next week. There are plenty of players who remember the sick taste of the disaster two years ago when the Beavers rose up and dominated the Ducks in the second half to score an upset win. Based on what we saw in the ASU game, if the Ducks don’t get something going in the locker room and on the field, they face the same fate. OSU’s poor record doesn’t mean anything in this contest, and to disrespect them and take them lightly is asking for trouble. This game has always meant more to the Beavers. The Ducks need to make it more for themselves, too. Buy the book here to learn from Coach Woody, or give a gift of football, a great gift for the fan who wants to learn and enjoy more of the Duck (or whoever your favorite team is) football experience. Ken Woody is a former Fox Sports football commentator who played defensive back, receiver and kicker for Oregon from 1966 to 1970. He coached college football for 18 years, including stints as an assistant coach at Oregon, Washington, Washington State and Utah State, and was head coach at Whitman College and Washington University-St. Louis. He writes x’s and o’s, a weekly column in the Register-Guard, RG online coverage of Duck football and is the author of “After Further Review—an inside look at what’s really happening on the football field.” Woody is on KUGN (590 am) 2:45 before kickoff and 30 minutes after each game with coaching and game analysis.